On this page, we will feature a few in stock paddles that are available for immediate sale. There will be a combination of paddles that are "On Sale" such as used demo paddles, "Scratch & Dent" specials, paddles that were built for custom orders but were made to a slightly wrong specification etc. Scroll down for some special pricing on in-stock paddles. Also check out our PADDLES in our Web Store and some of the current specials on our custom built paddles. Look for us as well on Facebook and Twitter. 55.5" canoe paddle with a 19.5" by 7" blade. Built out of western red cedar with a tung oil finish. Built from 11 strips of western red cedar and joined with a 10" carbon fiber ferrule. 2 pc shouldered Greenland Paddle with our 14" XL/ loom. Built from 11 strips of western red cedar. This paddle comes with a blade of roughly 24" X 5.75- 6" (slight variations due to the fact all paddles are completely hand built). Laminated from mainly western red cedar along with a strip of hardwood down the middle for added strength and durability. 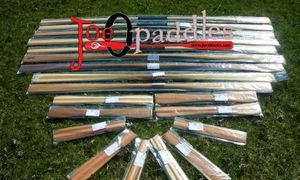 These 7 paddles are all in stock ready to go. To view specs of available paddles and to purchase, click the here. Sale Price $125.00 plus shipping. 3 of our Ottertail Canoe Paddles, in stock, ready to ship. These ones are 56", 58"and 58 inch"(left to right) with a 26" by 5.5 to 5.75 inch blade. Built from 15 pieces of wood and hand finished with multiple coats of 100% pure Tung Oil. Built from western red cedar plus a single strip of hardwood down the centre for added strength. On special for just $135.00 plus shipping. All built from 11 strips of western red cedar, finished in 100% pure tung oil. 180cm/ 71" length, 20cm/ 8"loom, 9cm/ 3.5"blade width. Non shouldered. 180cm/ 71" length, 22cm/ 8.5"loom, 9cm/ 3.5"blade width. Non shoulered. 180cm/ 71" length, 20cm/ 8"loom, 9cm/ 3.5"blade width. Soft shouldered. 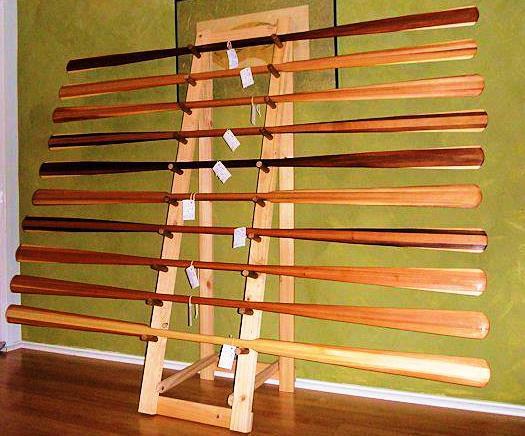 Each paddle built from 11 strips of western red cedar and hand finished with multiple coats of tung oil, these paddles are sized between 165 and 180 cm/ 65 to 71 inches and have loom lengths of about 35 to 42 cm/ 14 to 16.5 inches. Currently we have 6 in stock, ready to ship. We finally got caught up on these and have a few extras now in stock, ready to ship. For a full product description, click HERE for more information or to order. Here we have a 56.5" canoe paddle with a Greenland kayak paddle inspired blade shape but with a 4" width. We get requests for a few like this every year and thus have decided to start building them on a more regular basis. Laminated from 11 strips of wood. Ash and western red cedar. This is on for special pricing of only $119.00 plus shipping. Finished with multiple coats of 100% pure Tung Oil. Here we have a 56.5" canoe paddle with a Greenland kayak paddle inspired blade shape but with a 5" width. This one is also built from a single piece of solid western red cedar.